As it turned out, we made it through our first night relatively unscathed by the mosquitoes….in fact, neither of us were bitten once! We had set today aside to immerse ourselves in Balinese culture, so when the alarm sounded we sprang eagerly from the confines of our netted sanctuary and into the warm morning air and all that it promised. We started our day with a huge American breakfast of toast, bacon, mushroom, tomatoes, hash browns, eggs, pastries, juice, fresh fruit, tea….. honestly, the food was endless! All knocked up in the shake of a skink’s tail by our personal butler. And it was just the sustenance we needed for a day of exploring Bali with our tour guide Nowa. Nowa is the Owner/Operator of Bali Kini Tours whom we hired to drive us around some choice sights of Bali for the day at a cost of only USD$55. He picked us up from our villa just after 8:30am (in his mini van, not his ark!) and it was this cheerful, easy-going Indonesian chap who made our first day in Bali an unforgettable experience. 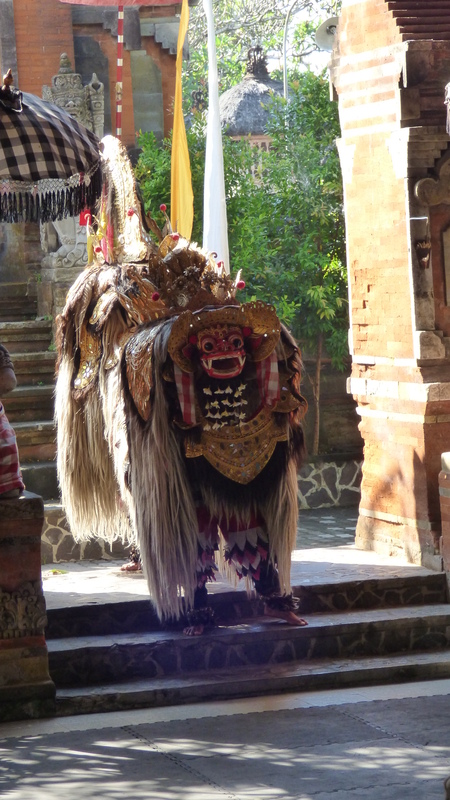 Firstly, we kicked off tour with a traditional Balinese dance experience: the Barong and Kris Dance. This was a play that represented the eternal fight between good and evil, a dance often performed in villages across the country as a way of re-establishing balance, putting wrongs to rights, and dealing with any evil spirits that may be lurking in the local communities. Of course, Nowa points out, evil can never be truly eliminated from the world (Amen to that brother! ), and the play also reinforces this idea. The costumes and performances were fantastic and I found myself mesmerised by the fingers of the Balinese female dancers. No matter how hard I try I simply cannot get my fingers to bend backwards as elegantly as they can. My big crooked western fingers just won’t do it! I also really enjoyed the role of one of the comical characters in the play who looked very similar to Billy T. James, a well known New Zealand comedian icon. Not, on this occasion, clad in a black singlet and gumboots, nor Mexican attire, but rather in Balinese traditional dress. While the other dancers performed their serious roles, he spent his time posing for photographs, eyeing up the ladies in the front row and generally strutting about the stage, and every now and then he would give the evil spirit a wallop with his branch of leaves for good measure. The music was a steady stream of traditional lang-lang-jingle-jangle-badoom-badoom-chang-chang, and the hour long show provided just enough of a taster of Balinese music to keep one’s brain clanging about for the next hour! I’ve read mixed reviews about this performance, and some were pretty scathing, but I thought it was a bargain at AUD$10 to get a glimpse of Balinese music, dance and religion. And anyone who complains that it wasn’t in English? Well that’s just ridiculous. That would be like going to New Zealand and complaining because the haka was performed in Maori! An informative sheet of paper, produced in a number of various languages, is provided to explain the gist of the story – and that’s all one needs. From there, just soak it up! While en route to our next destination, our questions about the dance and the ritual lead us into a very interesting conversation with Nowa about the beliefs of Hindu and other religions in Indonesia, the concept of making offerings each morning (holy water, flowers, incense = trinity) and the importance of the family and community temples. Nowa’s honesty and willingness to share his beliefs with us gave us a snapshot of a nation of people who are peaceful at heart and who live their lives trying to be, to put it simply, better people. Inspiring yes? 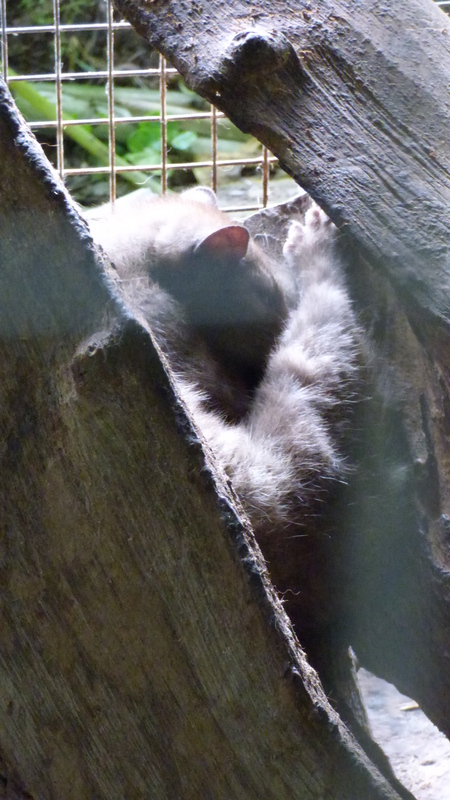 They are good natured, peaceful and happy, and one can’t help but admire their simple outlook on life. 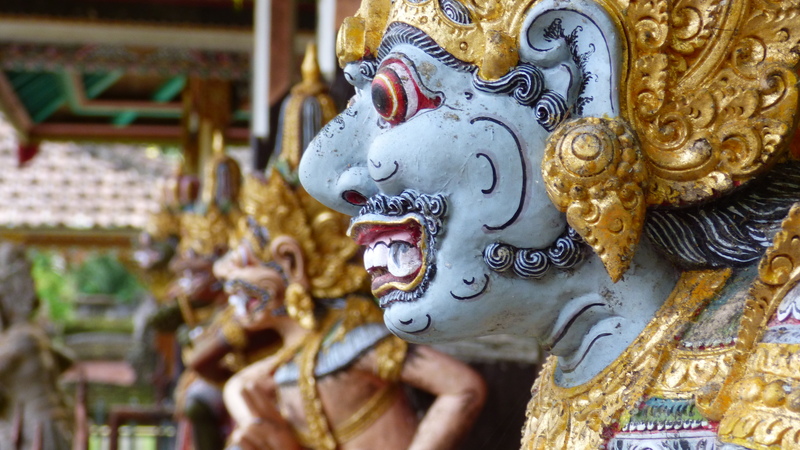 Our second stop on Nowa’s tour was at a traditional Balinese home, and perhaps I’m parading my Western ignorance a bit here, but when we arrived I thought that it was a museum. It wasn’t until I had rudely barged into the family’s sleeping quarters that Roger pointed out we actually were in someone’s home. I quickly removed my sticky beak from behind the wooden door and retreated feeling stupid and quite embarrassed! As we explored the family’s compound, Nowa explained the layout of the house in accordance with the Feng Shui principles. In the back yard the family had a plot to grow their corn, coconuts etc. and an old stone well with a bucket and pulley system from which they collected their water. As we strolled around the small individual buildings, chickens strutted and pecked around us and a young boy, about 5 years old, busily carted roofing tiles in his wheelbarrow from one end of the compound to the other. 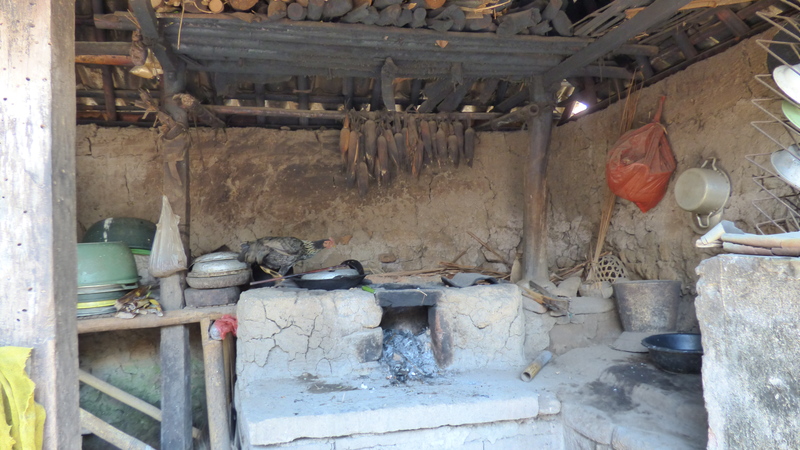 Corn cobs hung drying above the stove and I found myself gazing in disbelief at the primitive kitchen thinking: The woman in this home deserves a goddamned medal for cooking in there every day! While the women and children went about their business, it was thought that the father/husband was probably working on a local building site, a very respectable job that earned a sound wage of about 800,000 rupiah per week, (AUD$80 per week). 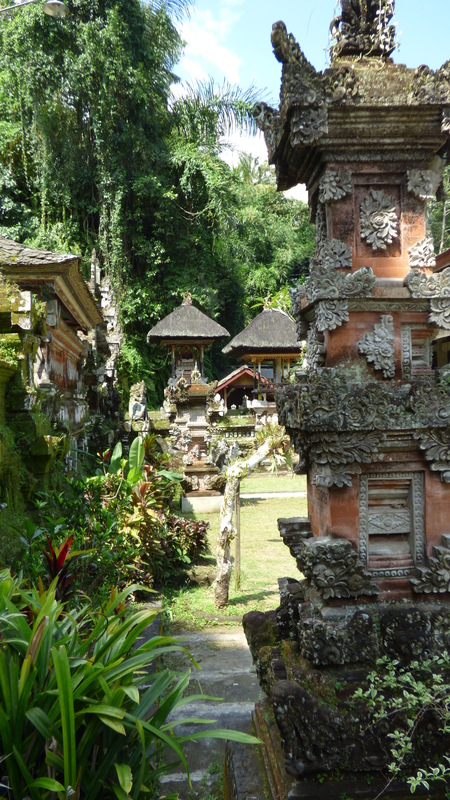 In Indonesian culture, the condition of a family’s temple symbolises the wealth or condition of the family, so everywhere we went the temples were immaculately presented and cared for. Many times, they were in better condition than the other buildings. The free-standing Westinghouse Stove? Notice the chicken has voluntarily made its way onto the stove top. Everyone, and everything, is happy in Bali! 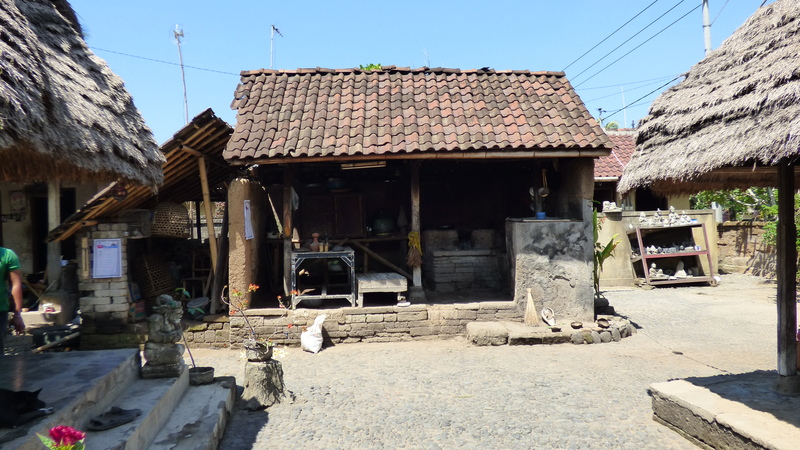 As a courtesy, Nowa asked if we would mind offering a 10,000 rupiah donation for visiting this family’s home. That’s about the equivalent of AUD$1. Looking around the compound forced me to reflect on my own life and provided a much needed injection of perspective. I don’t feel ashamed of the life I have, I have worked hard to earn it, but I am a little embarrassed by some of the unnecessary luxuries I have….that many Western people have, and think they ‘need’. 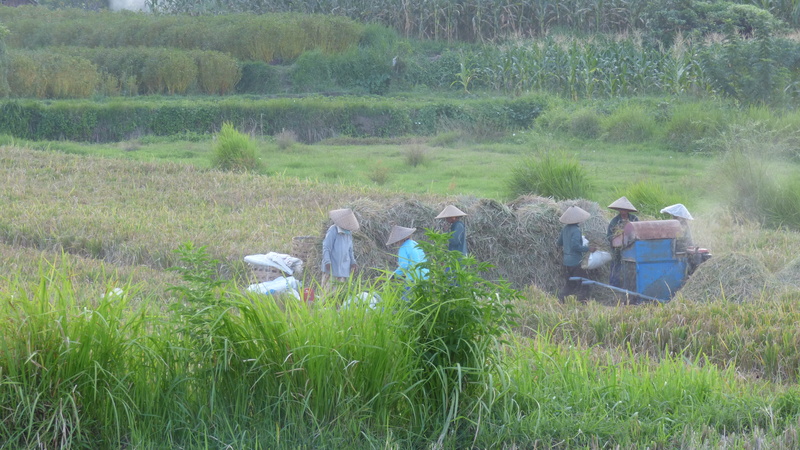 But the Balinese people are in no way unhappy with their lifestyle. Nor was this family looking for charity from us. As Nowa said, that’s not why he brought us to their home. It was simply to give us an insight into how everyday people lived – content and happy – and today, these mud and brick homes are being steadily replaced by concrete and tin dwellings. Near the gate, an elderly grandfather sat cross-legged against a clay wall playing (we think) a Balinese Suling flute as we strolled around his home. As the patriarch of the family, our meager donation was given to him and meet with smiling eyes. Had Roger’s voice of reason not been there, I probably would have emptied the contents of my wallet into his wrinkled hands, so compelled was I to share what I could easily afford. 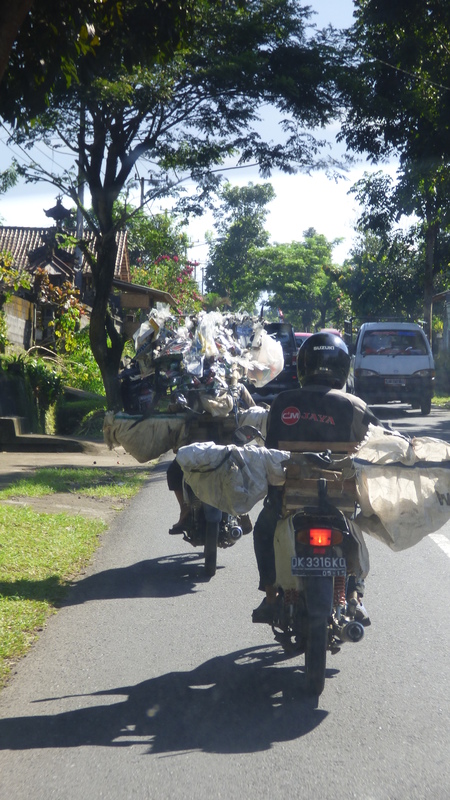 From here we piled back into our minivan and continued 30 minutes inland to Ubud. 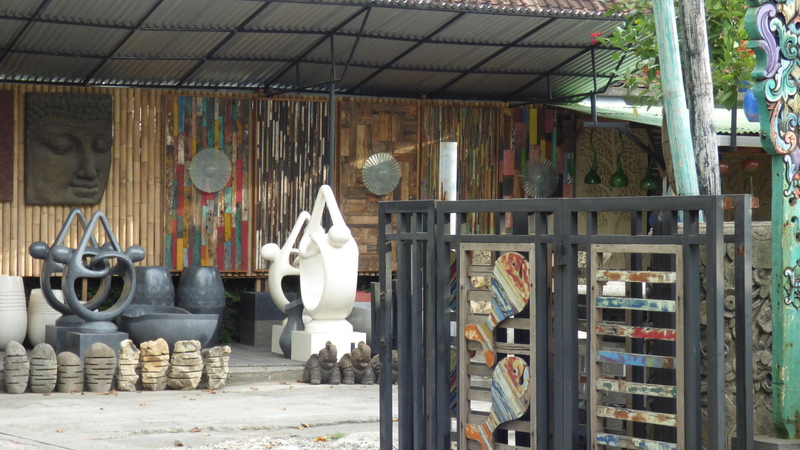 The rural scenery and local life of the villages gave us plenty to soak up as we whizzed past stalls of ceramics, paintings, wooden carvings, Balinese sculptures, elongated wooden giraffes and every piece of furniture you would need to deck out your house in true Balinese style. All of which we have seen scattered throughout various stores in Perth and New Zealand. 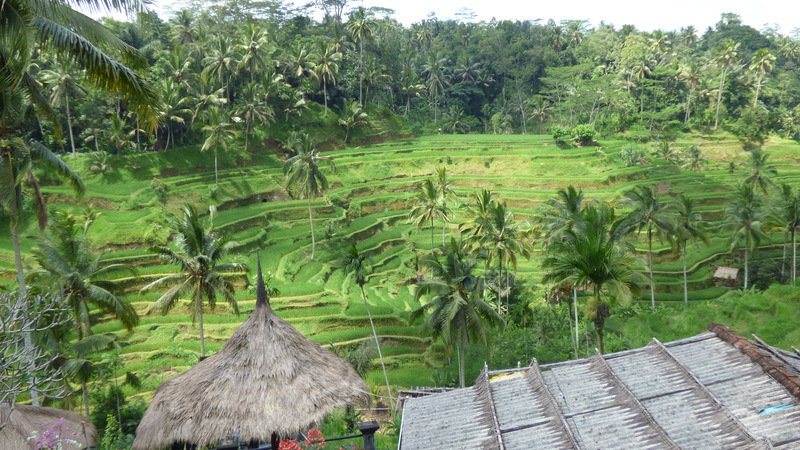 When we stopped for lunch at the Tegalalang Rice Terrace, it simply took our breath away. Talk about picture postcard perfect! 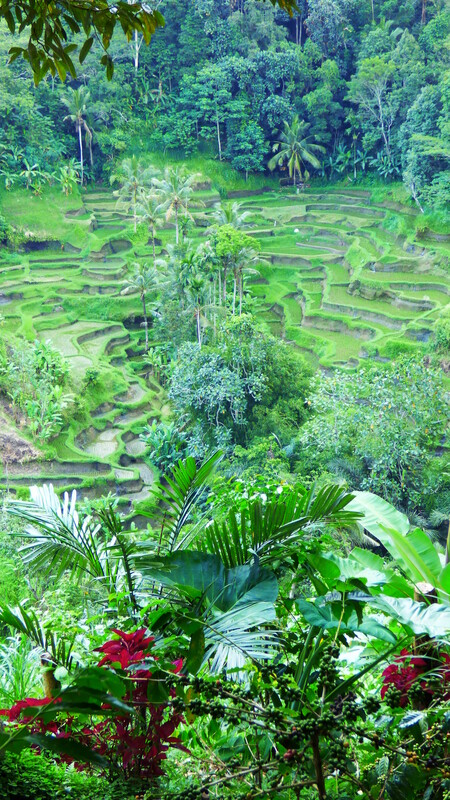 Here we ate lunch in a hut-like restaurant overlooking the green terraced paddy fields of Ubud. As we watched tourists meander peacefully along the terraces on the other side, a small leather faced man appeared on the winding path below us. He was in bare feet, wearing a grass hat, sarong and carrying a bamboo pole with woven flax baskets on either end full of rice. His toothless grin was infectious and he graciously posed with me for a photo. When he warbled “cheeeeese” for the photo, it occurred to me that this wily gentlemen had done this before. In fact, he had probably been hiding around the corner just waiting for chumps like us (and the ones after us who also employed him for a photo) to arrive! At 10,000 rupiah per photograph, he was definitely having a productive day! I’m not sure how much rice was gathered, nevertheless, he was a gorgeous character and I don’t begrudge him his side venture one bit. Additional Note: While we were eating at the restaurant, we noticed a small white drone flying above the paddy fields and we think that Roger has found the footage from that particular drone HERE on YouTube. It provides a fantastic view of the plantation – if you’ve got time, check it out! Stalls at the rice plantation – some fantastic paintings here but we only had carry-on luggage allowance. Next time though…. 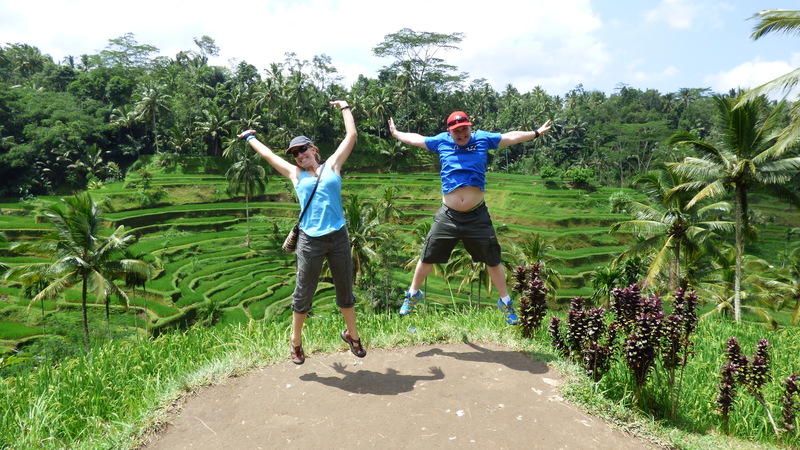 With some encouragement from Nowa, we performed a few acrobatic leaps for the camera in front of the paddy fields. Reflecting on these photographs later, Roger was decidedly impressed with his ability to gain “air”, certain that he could out-jump any AFL player on the current circuit. It must be all the cycling he’s been doing lately! Roger was very disappointed with my lack of ‘air’. NB: Roger’s six pack has been photo shopped into a one pack in order to add a more comical element to the shot! At least that’s his story! 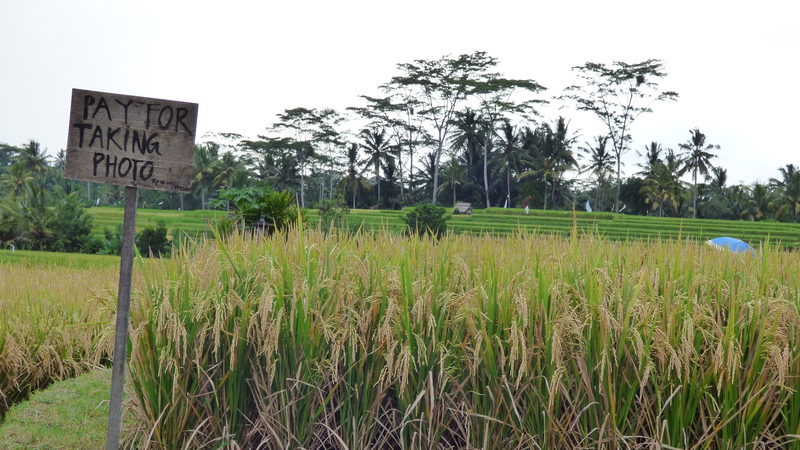 Wanting to avoid the market and busy central area of Ubud itself, we asked Nowa to take us to see more rural parts of the countryside around Ubud. So our next destination was the Springwater Temple and this turned out to be another stunningly beautiful and tranquil setting. Being expected to cover our legs before entering, Nowa helped us into our matching sarongs (Note to self: this is not your look Kiri, nor Roger’s for that matter!) and then took us for a leisurely stroll through the peaceful garden setting. 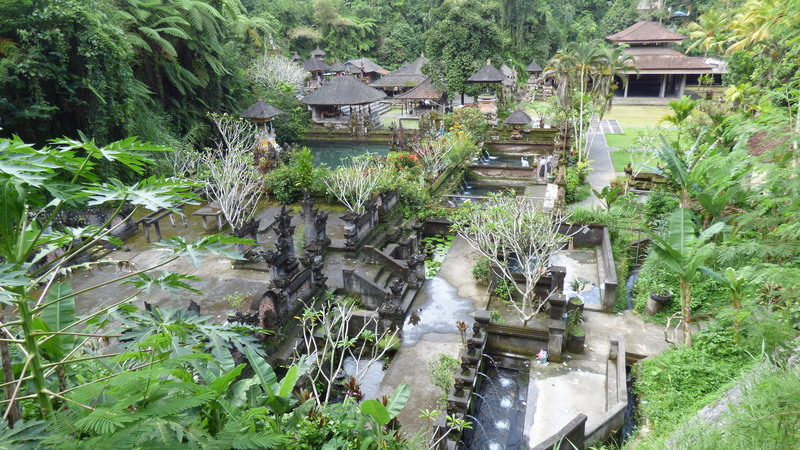 He informed us about the purpose of the various rooms and their functions, the bathing springs next to the temple, the different zones of the temple and the need for villagers to come here to collect holy water. All the while, enormous goldfish moseyed lazily through the various channels and under the bridges, following Roger wherever he moved along the pathway. Roger chatting with our friendly guide Nowa. 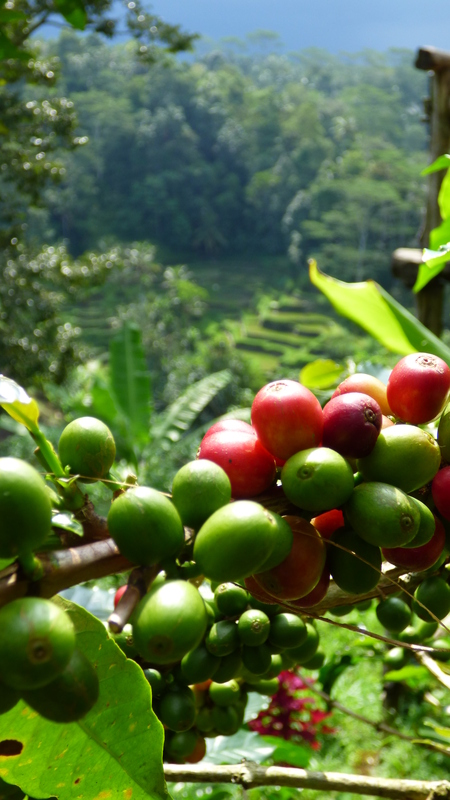 Our final pit-stop for the day – and the timing couldn’t have been better at 3pm in the afternoon – was a local coffee plantation. Not only were coffee beans grown here but other spices as well such as ginger, vanilla, turmeric, cloves, cocoa beans and lots of other things that I’ve only ever seen in the spice boxes in my mother’s kitchen. We weaved our way along the path, past the cocoa trees, coffee bean trees, past an old cow (for the milk? ), pineapple trees and banana trees before coming face to face with a row of cages containing a furry cat like creature in each. “And this creature is the Luwak,” our guide smiled, “of the world famous and very expensive, Luwak coffee.” Now, not being a particularly huge coffee fan, and not one to get the opportunity to rub shoulders with the rich and the famous much these days, the Luwak reference completely escaped me. Roger, in his usually eloquent way, made things as clear as crystal: “They eat the coffee bean, then they poo it out and then you drink it.” Sorry, who drinks it? I’m not sure that the tiny unsuspecting Luwak has any idea of its infamy or is quite able to appreciate the great heights to which it’s digestive system has risen, however, from this point of the tour I followed the journey of one of its cocoa beans: from the Luwak’s sphincter, to the drying stage, to the husk removal, to the roasting, to the grinding with the pestle and mortar, and finally into a tiny white china cup to be drunk by yours truly. Had I been in Hollywood, I would have paid USD$80 for the privilege. But here in Bali, it was offered to me for just 50,000 rupiah (AUD$5). Why wouldn’t you try it? Drinking my special cup of Luwak Kopi. Taster tray of various coffees and teas. In addition to this, I was also given the privilege of tasting (for free!) 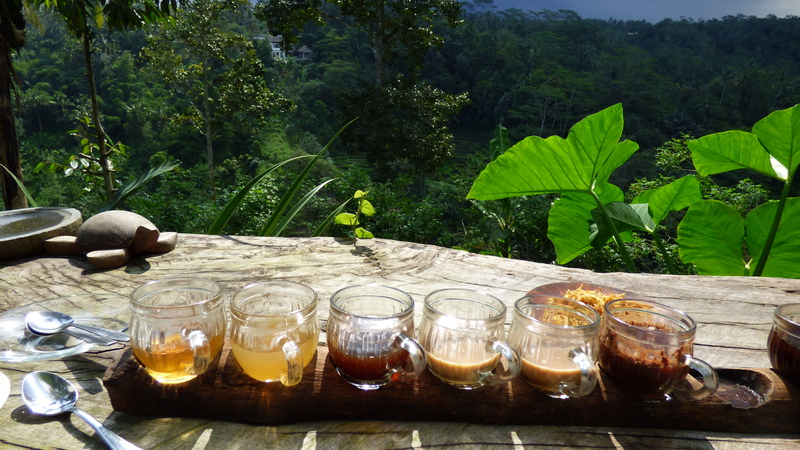 a variety of teas and coffees produced by the plantation. These arrived before me in tiny glass handles on a wooden tasting platter – not too dissimilar from my beer tasting days abroad, although much more civilised and sophisticated! 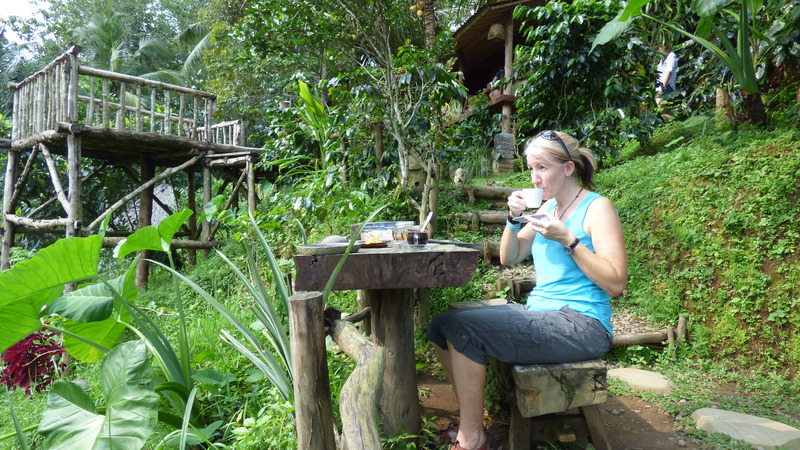 So sitting at our little wooden table overlooking a vast canyon and paddy fields laddering their way down the valley to the river below, I sat peacefully sampling ginger coffee, lemon tea, vanilla coffee, cocoa coffee and much more. Even Roger, who hasn’t had a cup of coffee for over 5 years, tested each cup – including the Lemon Tea which he told me afterwards usually brings him out in rash! It was a truly magical setting and a totally worthwhile experience. This was the perfect conclusion to our tour, and afterwards Nowa began the long drive back through the rural landscape of Bali to Seminyak. The narrow roads and their verges were alive with activity: cars, tourist buses, laden scooters, bicycles, women carrying baskets and sacks on their heads, men pushing wheelbarrows of produce from the fields, children playing soccer on dried up paddy fields, tired workers slicing rice grasses with their machetes, women walking home having made offerings at their local temple, and school children in bright red and white uniforms finished their learning for the day. Everywhere, life bustling past us. At the end of our first day in Indonesia we were overwhelmed by the friendliness of the Balinese people. They were such happy people and I wanted to reach out to them, touch them, shake their hands, speak with them, laugh with them. I wanted to connect with them – they seemed to have such beautiful souls. Even the officials -Polisi, security officers, village officials – all offered us big smiles and a friendly “Hello” as we trooped past them in the stifling heat on our way to visit their local attractions. As for Nowa, well he was just phenomenal. I would highly recommend this jovial fellow to anyone travelling to Bali. He listens carefully to what it is you want to see and he tailors the tour to suit you. He speaks superb English (and that’s endorsed by an English teacher no less! ), and his pride in his country is infectious. On top of that, he didn’t hesitate once to answer my numerous silly and naive questions! 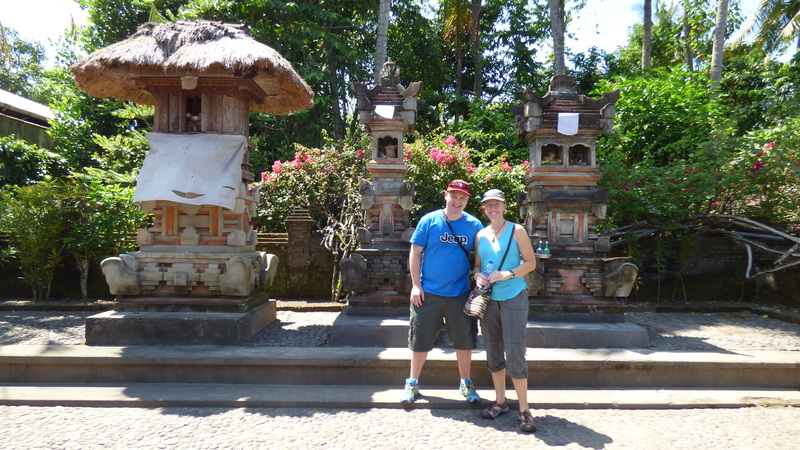 Bali Kini Tours – if you are going to Bali, you MUST spend a day with him or one of his other drivers who are equally “top notch”. On arriving back at our accommodation we plunged immediately into our private pool to cool off and then enjoyed a full 60 minute body massage for AUD$20 in the comfort of our bedroom. Shortly after, our butler arrived with our dinner and laid it out on the dining table for us. Then he sprayed our bedroom for mossies, turned down the bed, lowered the netting and wished us a pleasant evening. We were worlds apart from the people we had met today, but felt richer for having experienced their culture.